Odhiambo, J.A. ; Lukhoba, C.W. & Dossaji, S.F. Herbal drugs have been used since ancient times as medicines for the treatment of a wide range of diseases, for both human and l ivestock. 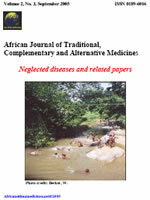 A study conducted in the Lake Victoria Basin Kenya revealed vast knowledge and reliance on traditional medicine as a source of healthcare. The study documented 34 medicinal plant species distributed among 21 botanical families and 34 genera, used in the management of human ailments. The highest numbers of species were from the families Asteraceae and Leguminosae . The most commonly harvested plant parts were leaves (46.51%) and roots (34. 88%). The most common growth forms utilised were herbs (40.54%) followed by shrubs (27.03%). The major methods of herbal drug preparation were concoction (31.03%) and decoction (24.14%) administered mainly through oral and dermal routes, (64.29%) and (32.14%) respectively. The use of herbal drugs as mixtures was reported to be a common practice by the herbal practitioners; 57.14% of the preparations were dispensed as mixtures while 42.86% of the preparations composed of single plants. A rich knowledge of medicinal plants was recognized and phytochemical and bioactivity analyses of these herbal plants are recommended to determine their safety and efficacy.